Baji hw to condense the meat ? Procedure plz. Hello , the step two in the above procedure is to condense the meat. So add enough water in a vessel or cooker along with marinated meat and keep it on till it is condensed. showers bunches of compliments from family n friends. This looks killer. I am gonna try this soon. Anjum ji, hamare pass ek mitti ka tandoor hai his me rooti our naan banti hai. Kyoki recipe tandoori raan ki hai, aap game tandoor ki tarkeeb batai. HiThe raan can be about 1 - 1.5 kg making sure its tender and to this add masala about 2-3 table spoons , it must go deep into to have the right marination. thnk u so much fr the reply. could u plz edit and update ur recipe with the above information . does the amount of red chilli powder also change with the weight of the raan ?? Hi.. Chilli power quantity depends on the level of spice you prefer. Yes, quantity will change depending on weight of raan..
Salaam alaykum baji. Can I condense the meat in oven? 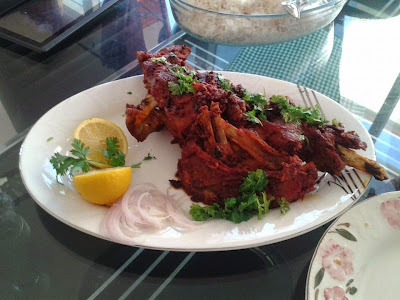 I m making this recipe with whole raan.